– all welcome to come along. 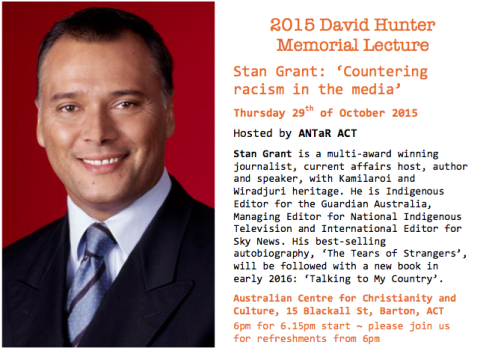 ANTaR ACT is very pleased that Stan Grant will give the 2015 David Hunter Memorial Lecture. at Australian Centre for Christianity and Culture, 15 Blackall St, Barton. You can find out more about David Hunter and the lecture series ANTaR ACT hosts in his memory at: https://antaract.wordpress.com/campaigns/.